There are many paths people take to find their purpose – and as fate would have it, Patricia Murray’s path started on the streets of Washington D.C.
How she came to be there is its own story, like those of millions of others who end up homeless in the US every year. Some are rescued by family and friends, government programs or nonprofit groups, while others have the fortune to find special people who reach out to help—and for Murray, those people included a judge, a nun, and hundreds of nursing home residents. When she came out of treatment, Murray went to live in Hannah House, a residential facility for young women who find themselves pregnant, abused, or in other crisis situations. There she learned practical life skills such as parenting, handling money, cleaning, and cooking as a means of stabilizing her life so she could prepare for a better future. During her stay at the shelter, she met Sister Carol, President of Providence Hospital, who was raising funds to keep the facility open. A compelling ambassador, Sister Carol invited Murray to join her fundraising mission and asked what she planned to do when she came out of the shelter. “I just want to work somewhere,” Murray replied – and that got the ball rolling. 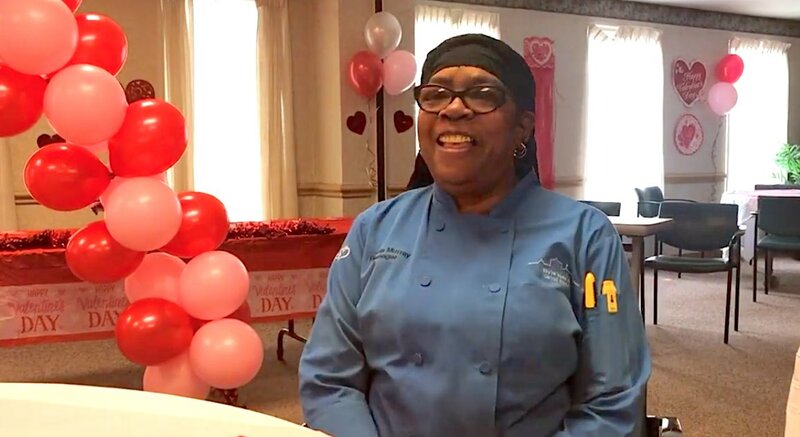 Sister Carol insisted that divine intervention would put Murray to work, and it ended up putting her to work at Carroll Manor, the shelter’s nursing home and rehabilitation center. Patricia wanted to be a cook, but they didn’t have any open positions, so she just did “whatever needed doing” and started working three and a half hours per day, making $5.25 an hour. “So I stayed,” Murray remarked, “and continued to live in the shelter. They let me out early in the morning, and when I returned at night, dinner was already over. “One of the supervisors at Carroll Manor knew I was missing meals and told me to eat something there. I’d stay and have dinner, and a fifth-floor resident, Mrs. Sutherland, would come down every evening to eat dinner and talk to me. “I told you there were people put in my path to help me get through … she was another one,” added Murray. “She talked to me about all the people at Carroll Manor that touched her life everyday—the nurses, the cooks, the housekeepers—and encouraged me to stay, and keep moving forward. When asked how it felt to win this award, Murray was reflective. “It was an awesome feeling … it took me back to where I started. And I kept thinking…you’ve come a long way to get to this point, and everyone is still rooting for you. Patricia got her life back by helping other people – and she hopes to encourage other people on the streets or in recovery by saying: “I never thought I could do it. I always thought I was gonna die in an ally somewhere. Yup, I really did; but, I got clean, I got a job, I came here, and I’ve been here ever since.